You know those nights where you stand gazing into the pantry or fridge wondering what to throw together for dinner? This casserole is often my answer. It’s not for a last minute meal, because it does have to bake, but the prep time is minimal. I baked 3 small chicken breasts and shredded them for this dish. I really like to have chicken already to go for casseroles in the freezer. You can also substitute canned chicken if you’re very short on time. 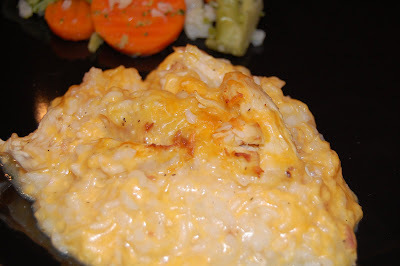 Place the chicken and cheese in a casserole dish and sprinkle the rice over it. Stir the broth, soup and pepper together and pour over the top. Yumm! I could go for some of this right now! And the cheese just goes on top? Do you think this would work with brown rice? I’m thinking I would need to increase the liquid a little or maybe add to the baking time. What do you think? Just being honest, that doesn’t look good to me. My main issue is the upper picture. Something about it isn’t appetizing. Yes, I have those nights often! This looks yummy! Brandy – the cheese kind of mixes in. I guess I put the cheese over the top of the rice then pour on the sauce. I didn’t say that in the post though. Sorry! I have made it with brown rice and it’s good. You do have to increase the cooking time to about 1 1/2 hours. Jacob – yeah, that picture isn’t the best and I almost didn’t post the recipe because of it. some things just aren’t very photogenic. But it does taste good, I promise! I think it looks yummy! Looks excellent. Think I’ll try it this weekend. Thanks for sharing! I make something very similar to this, but I like to throw in a pack of frozen mixed veggies. I’ll definitely be trying your recipe, it sounds better than mine! I won’t be home in time to make this tonight, so I am making it right now. Because I am using brown rice, I am letting it soak some before cooking. Can’t wait to eat it. Thank you for sharing it. Erin, the rice is dry. Just plain long-grain rice. Oh, man, this looks so easy and cheesy. Two of my favorite things. This looks wonderful. I try to keep all those ingredients on hand so I could easily make this. This sounds easy and good!!! I got an email from Country Bob’s about doing a blog give away……..I was kind of excited……..and your two recipes featuring them made me curious…. Made this last night– very good, some of the rice on the top was still a little crunchy. Should have read the info on the cheese? Couldn’t figure it out- I put it on top, would have probably been better with the cheese mixed in but it was very good. Combine sour cream and soup in 9×13 pan. Slice turkey bacon into bite size pieces and brown in skillet. Add bacon to 9×13 pan. add cooked chicken pieces, stir until mixture is combined and top with Parmesan cheese. Cook on 350 for 45 min or top looks golden brown. I like your recipe too. I make it often! YUM! Andrea, that sounds good! My boys would love the addition of bacon. Thanks for the recipe. I have this cooking in the oven right now!! very excited to try it… Thanks! i think this looks amazing! i cant wait to make it tonight! Courtney, resourceful! I love that idea. Anything that works and keeps you from running to the store is great. If you boil your chicken to cook it, the liquid left over is chicken broth. I recommend boiling chicken instead of baking it. We had this for dinner a few nights ago and enjoyed it. I used leftover chicken from a cooked chicken from BJ’s, and added some green Tabasco sauce for a little kick. I think I will use this recipe with some leftover turkey after Thanksgiving. Trying this for dinner tonight. Your’s Looks so creamy and cheesey and yummy and GOOD!… Mine however, I made in a weird shaped (deep) casserole and its not lookin so hot… hopefully it comes around! I’ll have to let you know! I made this last night for dinner and everyone really liked it. I love the simplicity of the preparation and ingredients and sat thinking of all the different things I could do to morph the recipe (not that it isn’t delicious as it is). I am looking forward to finding a way to add some mexican flair to the casserole. Yum! Janna, a Mexican version sounds fantastic! add a can of green chilis and use pepper jack cheese. Looks like YUMMY cheesy goodness to me 🙂 Am definitely making this week! Thanks for the recipe. I know my boys will LOVE it as I’m sure my husband & I will too! This was delish! Nothing but good ole comfort food. I finally found a good chicken and rice dish! I am making this right now! I added a package of chopped spinach (thawed & squeezed dry) and 4 slices of chopped up cooked bacon. It smells delish! I stay at home with my 2 boys (3 &16 months) while my husband is on active duty so it was nice to find an easy chicken recipe that will provide several meals. Thanks! Spinach and bacon sound like fantastic additions. Yum! I made this and it had a very good flavor but mine was extremely runny. Almost like a soup. 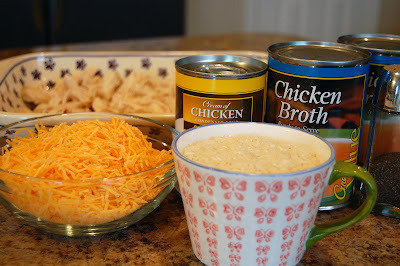 Not sure what I did wrong but the next time I will cut the chicken broth back to just one can. Otherwise it had a great flavor and can’t wait to try it again. I also had the same issue. It thickened up more once cooled but was soupy during dinner. I made the mistake of using cooked rice (3 cups). Tiffany: Can you edit your original recipe to ospecify the information about using dry, long grain rice ad adding the cheese after the layer of rice? That information would have been very helpful since I was making the recipe last minute nd didn’t have time to read all of the comments to get those details. The dish was therwise yummy and will make it gain with dry rice. After the chicken layer I also added 1/2 cup corn (frozen), 1/2 cup chopped onions (sauteed in a little butter with 2 garlic cloves), and 1/2 of a zucchini cut in half lengthwize and sliced. Yum! Stephanie, I edited the post. Thanks for pointing that out. This is one of my oldest recipes from when I first started blogging. I had a lot to learn! One of these days I need to do an overhaul of these old, but good recipe posts. I love your additions to the recipe. Yum! Has anyone tried freezing this casserole? If so would you bake it first? Kira, I’ve never tried freezing a casserole with rice in it. I’m not sure which would work better – freezing before or after. If you try it, let me know how it works. This is probably a dumb question but I’m a bit new at cooking. Do you bake the chicken BEFORE you put it in the casserole and bake it for an hour together? Or is it raw chicken that you put on top and bake for the hour? For most casseroles, including this one, you need to start with cooked chicken. Here’s a post I wrote about cooking meat to freezer for later and here’s one I did on cooking a whole chicken in the crockpot. That’s not a dumb question at all! No, the rice is raw. Making now and after an hour the rice is still hard. you dont have to cook the rice before just put it all in the dish?? That’s right. The rice cooks in the casserole. Jackie, sprinkle the dry rice over the chicken in the casserole dish. Then pour the sauce ingredients over the top of it and bake. Hope that helps. I am making this as we speak. For my future reference (I have high hopes for this) a can of broth is 14.5 ounces. I usually make my own broth or make it using a jar of Better Than Bouillon. This was good – easy to throw together and even my ridiculously picky fiance enjoyed it. The only issue I had was probably my fault. I added frozen mixed veggies, thinking they would cook along with it, but ended up having the cook the whole thing an extra 45 minutes because the rice was still crunchy at an hour and again 20 mins later (I ended up covering it for the last 25). Next time I will try precooking the veggies and covering it from the beginning. Did not see measurement for how much chicken? cup or pounds? Bev, I edited the recipe to show 2-3 cups cooked chicken. Thank you very much for your quick reply! Now ready to tackle this delicious sounding recipe! Trying this tonight & adding broccoli to it! Thanks! I’m thinking toss in a can of green beans and have a complete meal. Carrie, in this casserole I use long grain rice, not instant. Bailee, rice in the crockpot is a little tricky. You can do it, but it comes out a little over cooked in places. I’ve tried it a few times, but I haven’t been able to do it right yet. And you give the cheese to the dog? Does the rice cook itself when added to the casserole? Chris, yes the rice cooks in the casserole. No need to pre-cook it. I just put this dish in the oven and had to refer back to the web site to find out what to do with the cheese, after reading all the feed backs I think I will put the lid on the dish to make sure it cook s all the way for the rice. Here’s hoping for a good dish .. Oh by the way I had boneless skinless breast and just cubed it and cooked it in some broth then added the rest of the broth and soup to the leftovers. Thank you for a very simple dish.. love it!!!!!! Would instant rice work for this recipe do you know? Rachel, I think you would need less liquid and less cooking time. I’m not exactly sure how to adjust for that though. If you leave the cooking/liquids the same, I think the rice will overcook and be mushy. I tried cooking twice, followed instructions to a T. Still doesn’t work. Rice is completely uncooked after 2 hrs and 15 minutes in the oven at 350. It is warm and bubbling but my long grained rice is not cooked and it is just soup. Anybody else? Emily, I’m sorry it didn’t turn out. What kind of rice did you use? I used brown long grain rice and could it for 1 1/2 hours but the rice was still a little crunchy. Edible but a little crunchy. Any suggestions on how to fix that?? Brown rice will take longer to cook. It probably just needed to cook longer. how big are the cans of chicken broth? I made it exactly like the recipe said to but it was too soupy. I believe the problem is that rice cooks at a 2 to 1 ratio and there’s 2 cups of broth per 14.5 oz can, the recipe should be 2 cups of broth instead of 2 cans of broth. It was still good, we just ate it from a bowl instead of a plate. I made this tonight, with a few tweaks to the recipe. I cut the broth back to 2 cups and used garlic infused chicken broth. I sautéed some peppers and onions and added them with the chicken. I mixed all the ingredients together, rather than leaving them in layers. And I cooked it covered, for the entire hour. My rice was tender, and after five minutes stand time, all the liquid was absorbed. DH had two helpings, and wants the leftovers for tomorrow’s lunch! I like the tweaks you made. Yum! Looking for a quick meal: Cook 1 cup minute rice. chop chicken into cubes and cook in a pan (I like mine slightly browned for flavor). Add rice, can of cream chicken and a little milk (to desired consistency) to pan with chicken. Add whatever shredded cheese you like on top, and enjoy! (P.S. you can add mixed veggies easily) Or cut out the rice and bake biscuits. Do as above but make sure you add the veggies. when biscuits are done cut in half and spoon chicken over biscuits. Inside-out pot pie! I’m not sure how well the rice would do if you freeze it. I make this often. So good. I cover and bake a bit longer. We have a hurricane coming here tomorrow and this will be good to make before it gets here and t feeds a lot. We love onion so I sauté a bit and add to the casserole.